Primary among the ICT arsenal of tools is the OSINT System, a comprehensive survey of Open Sources of Intelligence. 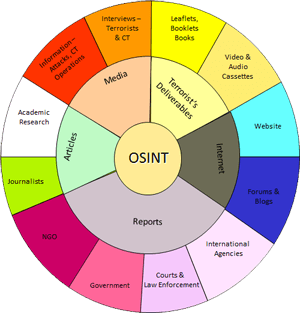 OSINT entails access to ICT's Incidents and Activists Database, one of the most all-encompassing non-governmental resources on terrorist incidents in the world. Based on comprehensive and integrated information compiled since 1975, the database records over 37,000 incidents, including successful terror attacks, foiled attacks, and counter-terror operations, along with background and follow-up information. The Jihadi Websites Monitoring Group (JWMG) is a specialized research and analysis team at the International Institute for Counter-Terrorism (ICT). Comprised of researchers fluent in Arabic, the JWMG monitors websites that support and serve the Global Jihad organizations. 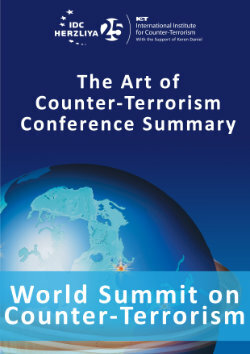 The unique characteristic of JWMG publications is the team's integration of diverse materials from a wide variety of Arabic sources. JWMG connects each source to larger trends, providing a complete understanding of events on both a local and a global scale. Recently, the JWMG started to record and analyze Fatwas by radical Islamic clerics and relevant news items from Arabic media. The ICT provides periodical & situational reports based on the needs and interests of its clients as well as in-depth studies on selected topics.